As promised, I’m back with a recipe today! This morning, we went to the wet market and found… Cod head! 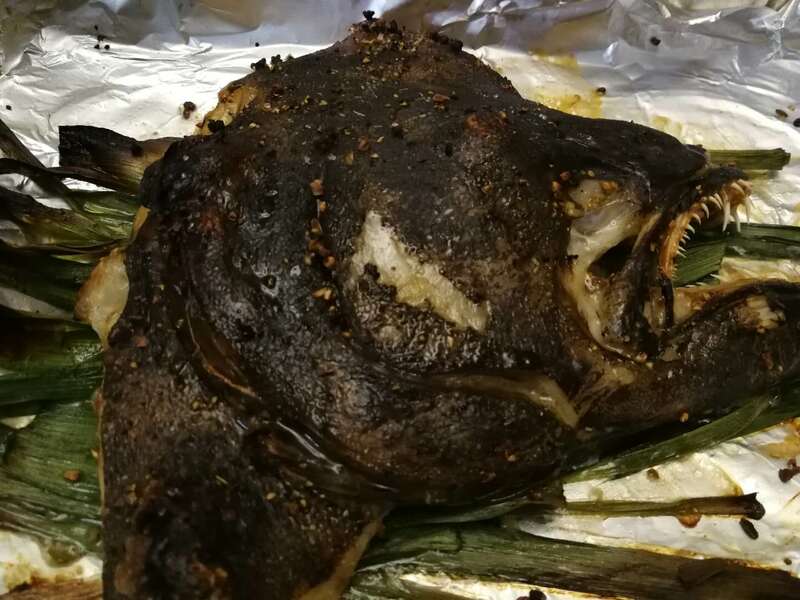 I’ve roasted salmon head and literally can’t resist it in restaurants, but this is something new. I HAD to try it. It’s simple and SOOOO delicious! So, let’s get roasting! Preheat the oven to 180C (360). Clean the fish head thoroughly, season and pat dry. Make sure the skin is as dry as possible for maximal crispiness. Tip: Salt is great, but for extra flavor, use steak seasoning. Wash, dry and cut the garlic sprouts.Place in a layer at the bottom of a large baking tray. The fish was INSANE- crisp skin, tender meat, perfectly seasoned. Also, Cod head has the same fattiness of salmon head, but with a milder taste. This meant it beautifully absorbed the fragrance of the garlic sprouts below. AMAZING! Well, that’s it for this break! I hope everyone had just as amazing of a week as I did. Until next time, bye! Da Dong at IFC: Peking Duck… with Caviar?